We finally made it. We’re about two thirds of the way through the season and the All Star Game is upon us. It’s mostly a silly event made for kids and the residents of the host city, but it’s still fun. It’s a window into some personalities that we might not get a chance to see in any other circumstance. That said, some personalities are not always welcomed. 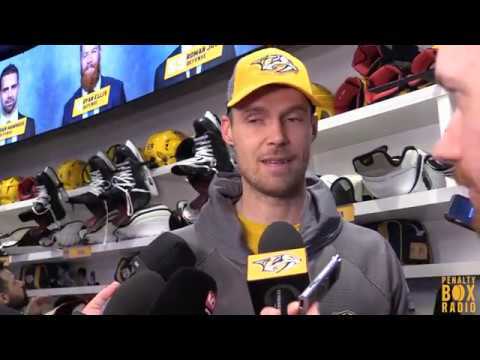 Pekka Rinne recently landed himself in some hot water among his own fan base by using a name in vain. It was mostly twitter outrage from people who have too much time on their hands, but it brought up some old memories for me. Hockey players are ruthless on the ice. They’ll do anything to win and talking trash (chirping) is certainly far from off limits. Sometimes it can be funny or good natured, and sometimes it can target a deep emotional wound. So when Rinne says the “gd” word, he’s not even considering it as profanity, because to him, it’s probably one of the more tame words he uses. Professional locker room culture is far from gentlemanly, even if we like to think hockey players are better than other sports. That said, some chirps are absolutely hilarious. Here’s a fun video, but it does contain profanity. I’ll have an article on this later next week, but is there any hotter Predator than Nick Bonino. He’s scored 10 points in 10 games, but I think I know why. Bonino has shot at 18.31% in all situations, but still sits in second place behind Viktor Arvidsson, who’s shooting at 20.65%. Regression could be a factor going forward, but let’s pour one out because it hasn’t hit today. The inevitable happened this week when Peter Chiarelli was fired by the Edmonton Oilers. Depending on who you ask, Chiarelli was fired at different times but one thing is for certain, he’s no longer the whipping boy. Let’s get one thing clear, I don’t think Chiarelli did a good job, but he doesn’t deserve the lion’s share of the blame. The whole organization is rotten with nepotism and ineptitude. The best example is literally standing in front of us as Keith Gretzky will take over as interim general manager. No, you heard me correctly, not the great one, but his brother will be in charge. Experts will say he’s paid his dues, but has he? Gretzky has worked as a scout since he was hired by the Coyotes in 2001, and then was the director of amateur scouting for the Coyotes and the Bruins. The only player of consequence “he” drafted was David Pastrnak, who, while great, isn’t much in a 10 year career. I’m sure Keith is a great guy and works hard, but what are his credentials besides not totally messing up director of scouting roles? I haven’t even really made my point yet. Hiring Keith Gretzky isn’t the problem, he’s a symptom. The issue is the old boys club surrounding the general manager as well as the owner who likes to meddle. It’s going to sound like I’m beating my own drum, but the Oilers need to get with the times. Hire the old boys club to be “brand representatives” and hang out with potential suite buyers, but keep them away from the decisions. Let someone new come in and revitalize the room. Allow the new manager to hire a new scouting staff as well as put some money into analytics. The Oilers are famously behind in this department, and it shows. So, if Darryl Katz is reading this, reach out to Michael Wade and I. We’ll start your analytics department for a relatively cheap price. I’ve gone on record saying that the Lady Byng award for most gentlemanly player is kind of stupid. I don’t really know how to quantify how a player can be gentlemanly, and I’m not sure if “heart” or other intangibles can be applied to this either. Nevertheless, if there’s someone who deserves it, it’s an old friend of Nashville. Sam Girard of the Colorado Avalanche has played over 1000 minutes this season but hasn’t registered a single penalty while remaining an effective defenseman. If anyone can give me a better example of a gentlemanly player, please let me know. If you like stats but don’t know where to start, Michael Wade and I will be tracking stats for the SECHC championship at Ford Ice Center from February 9th till 11th. If you’d like to help, feel free to reach out to me on Twitter or to Penalty Box Radio. There can never be too many volunteers and more people means more stats tracked. Who knows, you might just learn something.